Longtime readers have come to understand that Outside’s true gift is in chronicling misadventure. That’s the common thread among the stories found in Out There—those memorable tales that begin with the promise that, even if no one’s life is necessarily hanging in the balance, something may go horribly awry at any moment, and that documenting this misfortune will inevitably yield rich comedic material or a surprisingly poignant moment. Or sometimes both. 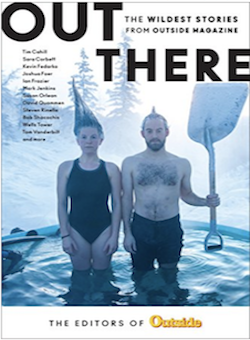 Out There chronicles fringe athletes, fitness freaks, and others obsessed by ill-advised dreams. It takes us to far-flung places no sane person would want to go. What ties this collection together are the incredible voices of legendary Outside contributors such as David Quammen, Tim Cahill, Susan Orlean, Wells Tower, Christopher Solomon, Patrick Symmes, Taffy Brodesser-Akner, Nick Paumgarten, and many others, who turn their subjects into literary gold and have helped to keep Outside in business for more than forty years.